Fish Go Deep are Irish house dons Greg Dowling and Shane Johnson. Their friend and fellow DJ Colm Motherway will be joining them under the hammers. 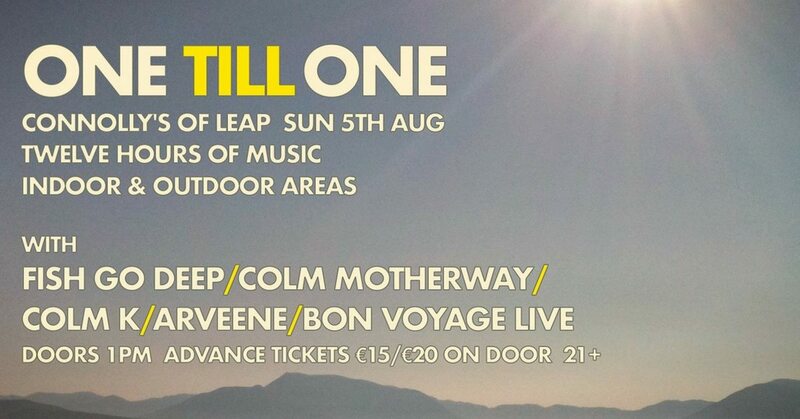 Cork’s finest DJ and producer Colm K, will bring a supreme array of soulful, dance-able, beat-driven music. Colm K is one of the most respected DJs in Ireland. Humble beginnings at the infamous Sir Henry’s saw him grow as DJ in his hometown of Cork, Ireland and lead to numerous residencies at reputable bars and clubs around Ireland including: The Pavillion, The Savoy (Cork), Ri Ra (Dublin), Trinity Rooms, GPO, Bar Cuba & many more besides. Arveene Juthan, who DJs as Arveene, is a connoisseur of the Irish dance world. Whether behind the decks in Dublin clubs, or behind the books curating events around the world, Arveene has well over a decade of experience in the industry. Bon Voyage are an international Hip-House 3 piece from Brooklyn, London & Dublin respectively: Dropping bass lines and spilling rhymes, for your catwalk and dance floor excursions. They channel Fast Eddie, Doug Lazy, Traxx Records, George Clinton & Mike Dunn as spirit guides, closely washed down with a penchant for Alejandro Jodorowsky and the general vibe of Andre Aggasi. Dj Supreme – The London based master of connections, traveling the globe slaying clubs and always in search of the perfect beat.